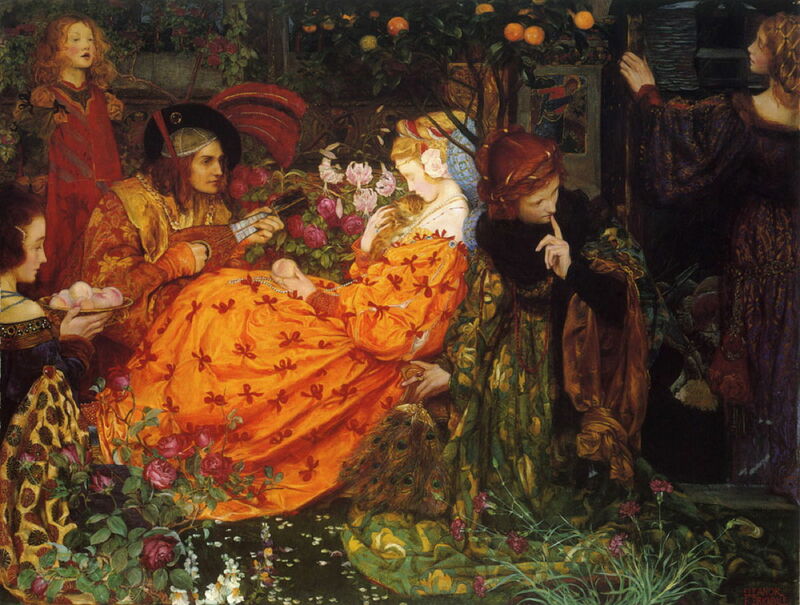 Eleanor Fortescue-Brickdale (1872–1945), The Deceitfulness of Riches (1901), further details not known. Wikimedia Commons. 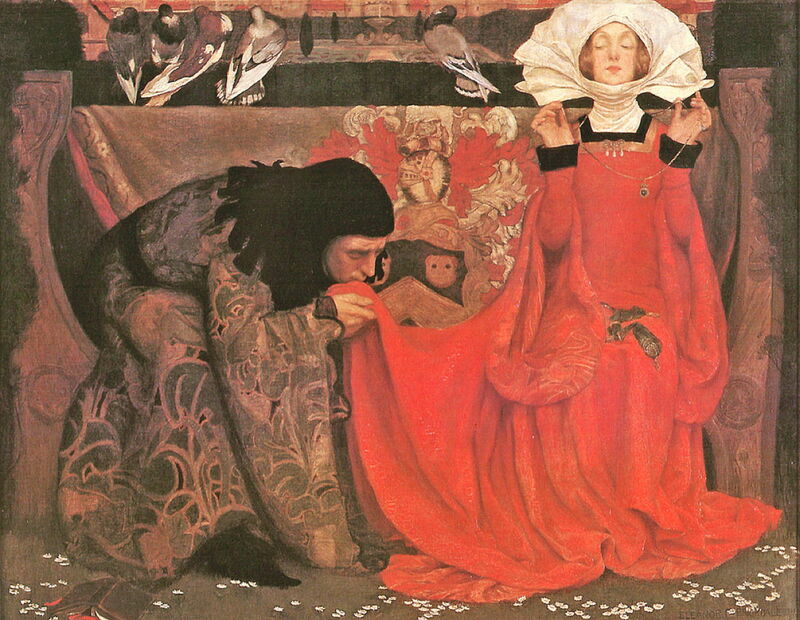 Don’t be put off by her name: although Eleanor Fortescue-Brickdale (1872–1945) might sound like a wizard hockey player and head girl of her private school, and was certainly something of an anachronism, she was a fine painter who was also a campaigner for women’s rights. She was born to an affluent family: her father was a leading barrister, and home was in the leafy lanes of Upper Norwood in Surrey, England. She was a precocious artist, and started her studies at the Crystal Palace School of Art, before entering the Royal Academy Schools in 1897. Women had only been admitted to the Schools since 1860, and she was already working beyond the bounds normally expected of women artists, by producing commercial illustrations for magazines, including Country Life. Her major influences seem to have been John Byam Liston Shaw, who in turn was influenced by John Everett Millais and J W Waterhouse. Her work received rare praise from George Frederick Watts, then a veteran of Victorian painting. 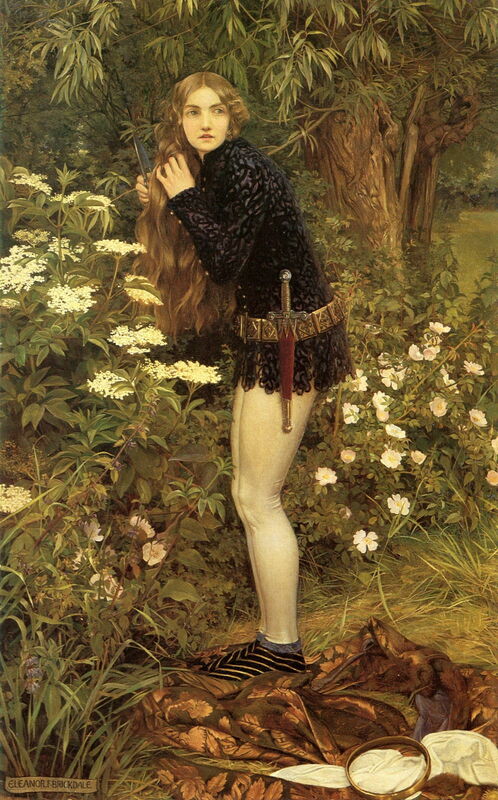 Eleanor Fortescue-Brickdale (1872–1945), The Pale Complexion of True Love (1899), further details not known. Wikimedia Commons. The Pale Complexion of True Love (1899) is her first major work, which was exhibited at the Royal Academy. Its title is taken from Shakespeare’s As You Like It – such literary quotations being popular with Victorian artists, and often used by Fortescue-Brickdale. Although it was fifty years since the Pre-Raphaelite Brotherhood had revived styles from the early Renaissance and before, she has depicted an Elizabethan scene in similar style, and brilliant colour. Eleanor Fortescue-Brickdale (1872–1945), The Gilded Apple (1899), watercolour over graphite, 45 × 26 cm, Private collection. Wikimedia Commons. Her watercolour The Gilded Apple, also from 1899, shows a fairytale princess being thrown a gilded apple. As her crown is about to fall into a fishpond behind her, a cat is sizing up its next meal from the water. This was exhibited at the Dowdeswell Galleries in London in 1901. Eleanor Fortescue-Brickdale (1872–1945), A Knight and Cupid Before a Castle Door (1900), watercolour, 32 × 40 cm, location not known. Wikimedia Commons. 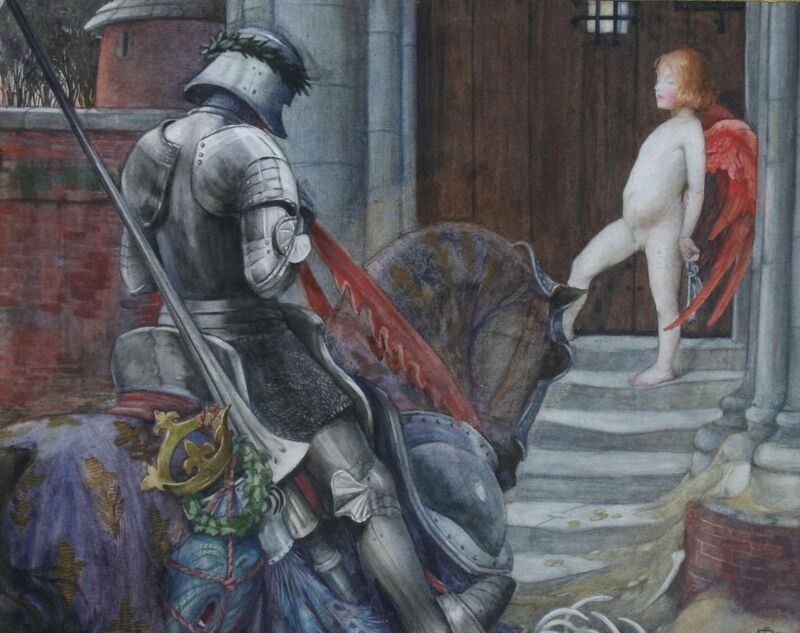 In her watercolour of A Knight and Cupid Before a Castle Door (1900), Cupid, the god of love, is the custodian of the keys to the castle. The knight, who wears a laurel wreath around his helmet indicating victory, must convince that Cupid that he is fit to enter. Slung at the side of the knight’s charger are a crown, another laurel wreath, and a sleeping (or dead) dragon. The Deceitfulness of Riches (1901) is another work of brilliant colour. At its centre, a fair maiden is asleep, holding a peach in her left hand. Figures around her are more active, holding out a bowl of peaches, playing music to her, and stealing away with a fan made of peacock feathers. In 1901, Fortescue-Brickdale exhibited forty-five watercolours at the Dowdeswell Gallery in London. These sold well, and she was able to acquire her first proper studio, in Holland Park, not far from Leighton House, which had been the residence and studio of Frederic, Lord Leighton until his death in 1896. 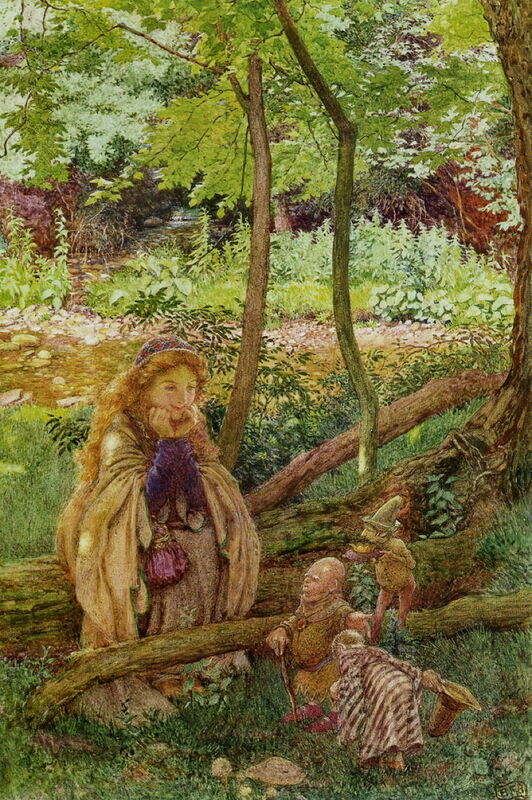 Eleanor Fortescue-Brickdale (1872–1945), The Poet (1903), watercolour and bodycolour, 47.5 × 28 cm, location not known. Wikimedia Commons. 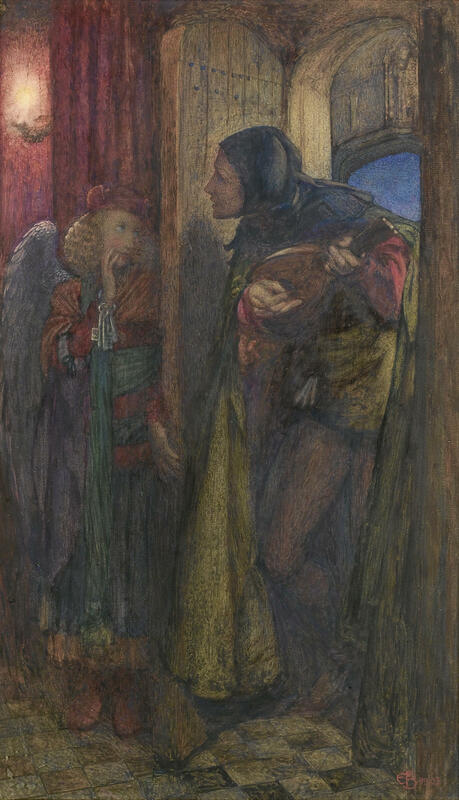 The Poet (1903) is a watercolour showing a minstrel singing to a winged female angel, who is carrying a bunch of keys. 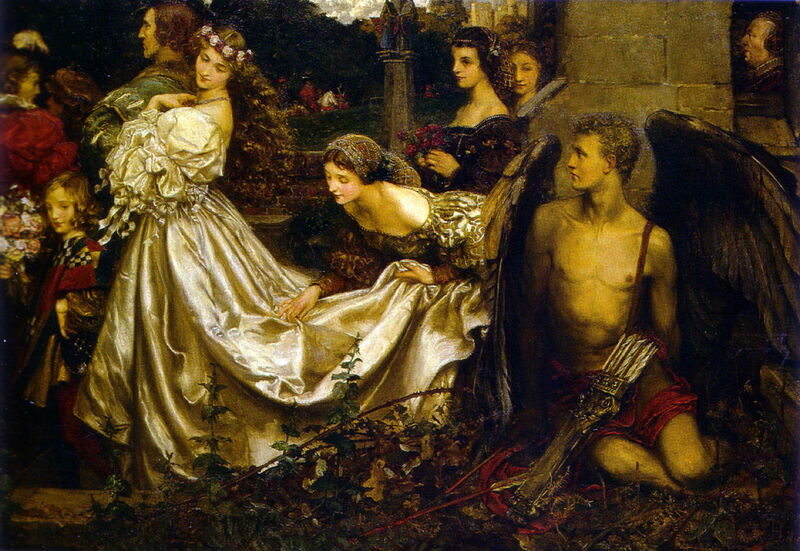 Eleanor Fortescue-Brickdale (1872–1945), The Introduction (before 1905), further details not known. Wikimedia Commons. In The Introduction (before 1905), the senior of three gnomes is introducing another to a girl wearing romantic mediaeval outdoor dress. 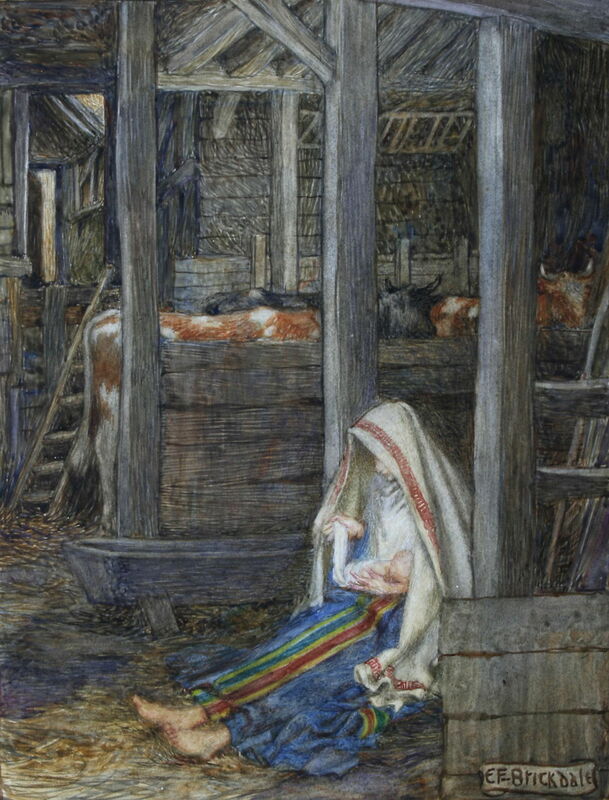 In a contrast to her Pre-Raphaelite style, her undated watercolour of The Nativity has a contemporary look, apart from the Virgin Mary’s costume. Eleanor Fortescue-Brickdale (1872–1945), Love and his Counterfeits (1904), watercolour and graphite, 66 x 133.4 cm, Private collection. Wikimedia Commons. 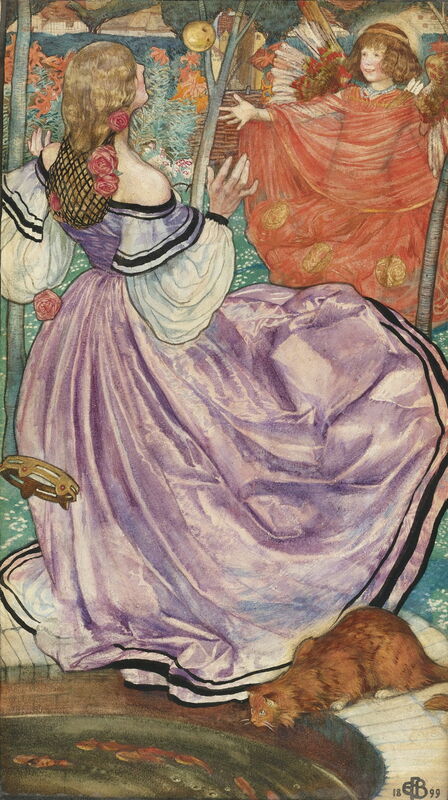 Love and his Counterfeits (1904) is another watercolour which was exhibited in 1905. It was accompanied by a text written by Fortescue-Brickdale explaining the scenario as that of a girl’s soul (at the left) awakening to receive love. She doesn’t recognise him at first, seeing instead Fear in black armour, and Romance as a boy on a bubble with a miniature castle of dreams. He leads Ambition, who rides on Pegasus, following which is Position. Then comes Pity, with a cup of tears with three handles. Later comes Flattery with a mirror, and Gratitude, and finally True Love, at the far right. Eleanor Fortescue-Brickdale (1872–1945), The Little Foot Page (1905), oil on canvas, 90.8 × 57 cm, Walker Art Gallery, Liverpool, England. Wikimedia Commons. Among the oil paintings which she exhibited in 1905 is The Little Foot Page (1905), which shows a scene from the Scottish ballad of Burd Helen, in which the heroine, an abandoned and pregnant lover, cuts her hair and disguises herself and her pregnancy, to pursue her lover. Eleanor Fortescue-Brickdale (1872–1945), The Uninvited Guest (1906), further details not known. Wikimedia Commons. Fortescue-Brickdale’s The Uninvited Guest (1906) is probably about marriages of convenience, which were contracted for wealth and status rather than for love. Eleanor Fortescue-Brickdale (1872–1945), If One Could Have That Little Head of Hers (1910), watercolour, bodycolour and gold, 31.8 x 19 cm, Russell-Cotes Art Gallery and Museum, Bournemouth, England. Wikimedia Commons. If One Could Have That Little Head of Hers (1910) is a watercolour with a curious title which appears once again to be a quotation. 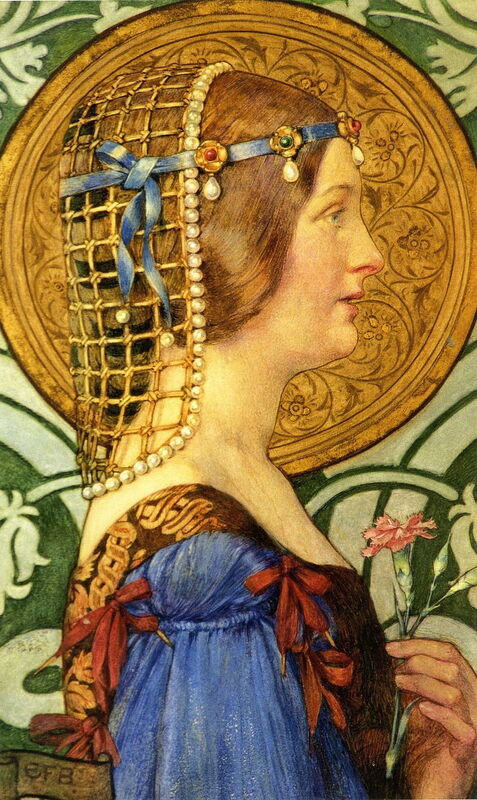 The woman shown is presumably a saint, judging by her large gold halo, but is in early Renaissance dress. In 1911, John Byam Liston Shaw founded an art school, and Fortescue-Brickdale soon started to teach there. From 1909, she worked on a commissioned series of twenty-eight watercolours to illustrate a printed edition of Tennyson’s Idylls of the King, which retells Arthurian legends. She completed these in 1911, when they were exhibited, and the book was published in 1913. Eleanor Fortescue-Brickdale (1872-1945), Elaine of Astolat (1909-11), illustration in ‘Idylls of the King’ (1913), further details not known. Wikimedia Commons. 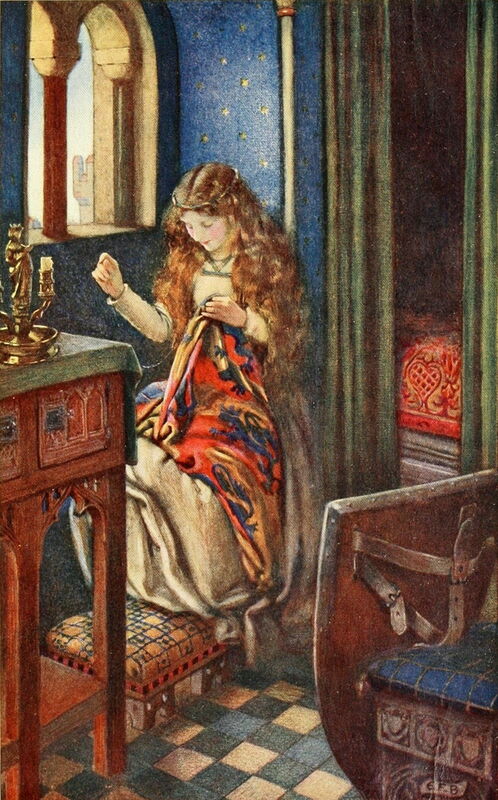 Elaine of Astolat is shown sitting sewing in the family castle, guarding Lancelot’s shield. Perhaps her most famous book is her Golden Book of Famous Women, an anthology of writings about famous women by well-known authors, with sixteen colour prints of illustrations by Fortescue-Brickdale. This starts with Helen of Troy and Cleopatra, and ends with fictional characters of Dickens and George Eliot. 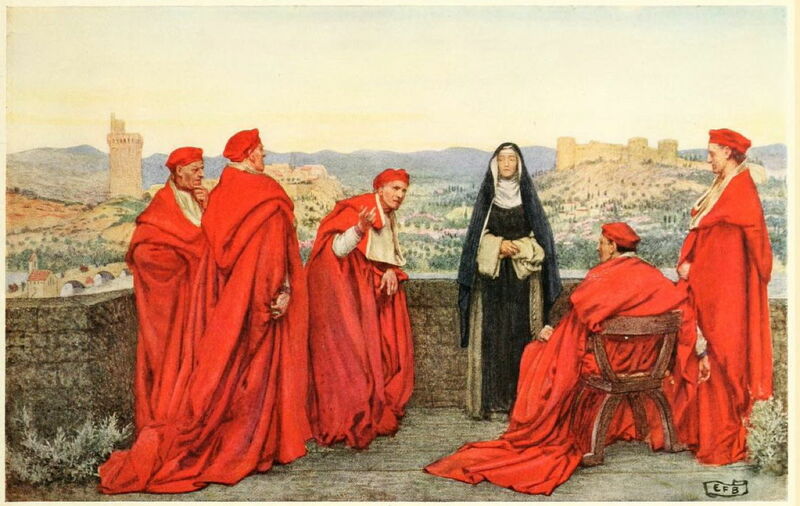 Eleanor Fortescue-Brickdale (1872-1945), St. Catherine of Siena (1919), illustration in “Golden Book of Famous Women”, p 239, further details not known. St. Catherine of Siena (1919) shows the Dominican philosopher and theologian, who lived from 1347-1380, apparently debating with cardinals above the city of Rome. Eleanor Fortescue-Brickdale (1872-1945), Joan of Arc Praying (1919), illustration in “Golden Book of Famous Women”, further details not known. 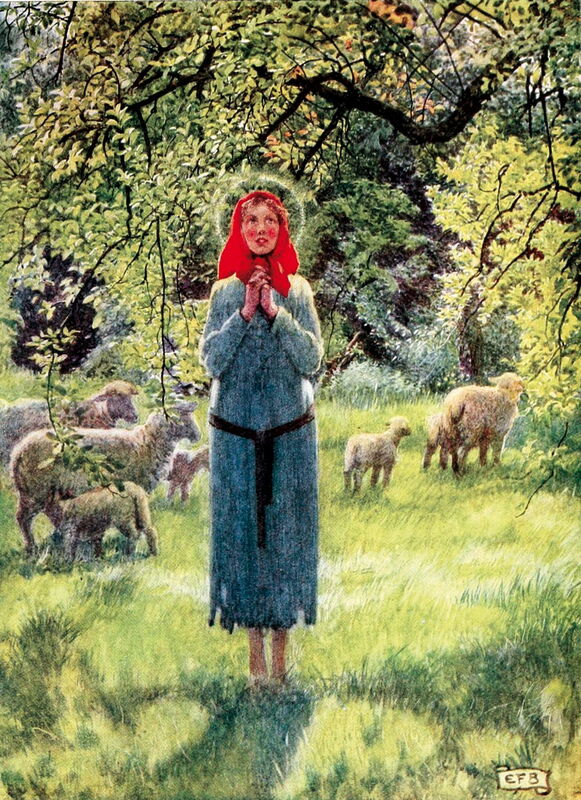 In Joan of Arc Praying (1919), Joan is shown as a poor peasant girl, praying among the sheep grazing in the countryside. During the 1920s, after she had painted her superb art historical works The Forerunner (1920) and Botticelli’s Studio (1922) (detailed in the previous article), her eyesight began to fail, and her health started to deteriorate. She worked more on small watercolours, stained glass windows, and altarpieces. In 1938, she suffered a stroke, and died in 1945. Was she the last Pre-Raphaelite, or should that be accorded to Marie Spartali Stillman, who had died in 1927? It depends on your criteria for being a Pre-Raphaelite. Stillman was certainly the last of those who had been part of the artistic circle of Pre-Raphaelites, and had dined, laughed, and debated with Dante Gabriel Rossetti, William Morris, and others. Rossetti died when Fortescue-Brickdale was only ten, but she was the last of those who painted true to the movement’s style. Eleanor Fortescue Brickdale’s Golden Book of Famous Women, at archive.org (downloadable in various formats). John Howe’s The Stuff of Dreams, a detailed study of her career and work. Strongly recommended. Posted in General, Life, Painting and tagged faerie, Fortescue-Brickdale, narrative, painting, Pre-Raphaelite, Shaw, Stillman, Watts, women in art. Bookmark the permalink.